My Little Patch of Sunshine: Do You Jump on Your Bed? Do you jump on your bed? Do you let your kids jump on the bed? What about when you stay in a hotel? 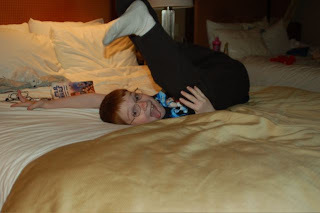 I confess -- my kids do jump on the bed, and I've been known to encourage jumping on hotel beds. Which is why this promotion tickled my funny bone. Intercontinental Hotel Groups sponsored the "World's Biggest Bed Jump" this summer, and are offering a special "Stay 2 nights, then get 1 FREE" offer through August 15. When you stay at any IHG hotel (Holiday Inns, Crowne Plaza, Hotel Indigo & more) for 2 nights between now and August 15, 2009, you'll receive a free night anytime between now and December 26, 2009! There are some specific rules -- so check out Get A Free Night for all the details. I have three $10 iTunes gift cards to give away! To enter, leave a comment telling me if you jump on your bed, or what song you'd add to your playlist if you won, or where you're going on vacation this summer. We jump on our beds...and we'd buy the song "JUMP" by Van Halen! We're heading to Disney next weekend- what would Mickey think if we DIDN'T jump on the bed?? Jump on the bed? But of course!! Especially at hotels. Gotta have some kind of quality control. What song would I want to jump on the bed to? Lemme ask my kids....."In The Ayer" by Flo Rida. I just got back from a Disneyland trip recently, but have a huge family reunion planned for my family to come here at the end of the summer. I would listen to the song in the beginning of wedding crashers while jumping on my bed lol. Umm and if I won I would buy a michael jackson album! I found this on google! Anyway if I won I would buy Chris Daughtry's new album. No Surprise is such a great song! I'm going to Europe for vacation! My family is planning to go to Germany and Spain and Italy near the end of the trip. Should be Fun! Yes, I allow the elevation of young souls to adjust the neatness of our temporary living quarters from time to time. An occasional flip if we are dealing with King/Queen dimensions. The songs I always wish we had playing was House of Pain - Jump or good ole xris xross from back in the day. First off, I'd like to say great competition! If I were to hypothetically want to jump on my bed (which may be a secret desire :)), I would listen to Jump by N.E.R.D. If I were to hypothetically win (which I have a feeling I might), then I would buy a movie. Or I would just buy an album such as big whiskey and groogrux by Dave Mathews Band. If I had a million dollars...Oh nvm...If I had TEN dollars, I would go out and buy the cobra starship cd. Ya. That's what I would do. Hello. I have 4 children and they ALL jump on their beds. I scold them for doing so because jumping on the bed is not good for the bed. But once in a while, I think about it and I know that when I was little, I enjoyed jumping on the bed too. So I can't really blame them. Alex, the contest ends tomorrow (July 24) and I'll send out the prizes next week. The last paragraph of the post mentioned the contest end date. Good Luck to all who left comments! When I was 9 or 10 I tried to do a standing front tuck on my bed. I landed the flip but broke the bed. :) I was jumping on a bed in a hotel with my teammates and broke the bed. Our coach came in the room, and we pretended nothing happened even though the bed was leaning pretty badly. That is one of my favorite swimming memories. We definitely jump on beds here and got reprimanded for doing so at Nana's house last week! I'd love to buy Mercy by Duffy...seems like a good jumping song. It says the deadline is Friday but no specific time so techinically I'm still qualified? Hopefully :) Anyway I've been eying the The Black Eyed Peas Cd for quite sometime. Maybe I'll finally get the opportunity to get it! Oh almost forgot, email jackth3ripp4@yahoo.com. Thanks! My favorite band is Dream Theatre and I would love to buy their greatest hits album on itunes. Please let me win! My daughter jumps on the bed. I do not like it at all! I'm a guy, so I might get flamed for this, but I really like Lady GaGa's music. I would really like to get her new album. Mel- Who are all these people? Way to get the blog out there.